The number of winning candidates of the ruling, opposition parties and Komei in Nago City Council Election. Red shows 14 candidates of the Nago city ruling party, blue 11 opposition candidates and green two candidates of Komei. Brown suggests 16 candidates who are against the Henoko relocation plan for US Futenma Air Station by the central government. On September 7, the outcome of Nago City Council Election was released. The election drew national attention with candidates focusing on the for and against arguments of building a new base in Henoko to replace US Marine Corps Air Station Futenma. Ruling party candidates, who support Mayor Susumu Inamine’s strong opposition to the relocation work, won the majority of seats in the council. The ruling party won 14 seats in its 27 member council, while the opposition party gained 11 seats. Komei Party members who oppose the relocation work won two seats. With the victory for opponents of new US base construction, there will be growing criticism against Okinawa Governor Hirokazu Nakaima, who approved the Henoko landfill, and the government that has ignored the local opposition and forced the relocation work. It is the fourth time that citizens have shown their democratic will to oppose the relocation in the mayoral and city council elections, including the mayoral election in January 2010, in which Inamine was first elected as mayor. The Nago City Council Election was positioned as a prelude to the upcoming Okinawa gubernatorial race, which will be held on November 16. Governor Nakaima supported opposition candidates who accepted the relocation, while Naha Mayor Takeshi Onaga, a potential candidate who opposes the relocation, cheered the candidates of the ruling party at a speech he made in the city. The result of the city council election, in which the candidates opposing to the relocation work gained a majority, will likely have an impact on the gubernatorial election. 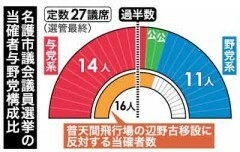 Before this election, the ruling party had 15 seats, the opposition ten seats and Komei Party two seats. Thirty-five candidates ran for the election this time. The supporters’ organization for Mayor Inamine actively backed 16 candidates of the ruling party. The Liberal-Democratic Party, a ruling party of the Okinawa Prefectural Assembly and the national diet, supported 15 candidates with help from private companies. The two camps fought a fierce election campaign. Five newcomers, including two of the ruling party and three of the opposition party, won seats on the city council. The number of voters was 32,539 people of 46,219 eligible voters. Voter turnout at 70.40 percent was 1.67 points below the previous election. Early voting was 27.36 percent of the eligible voters, which was 12, 647 people, an increase of 2,046 voters from the previous election. Nago Mayor Inamine’s comment: We have been working hard with the aim of winning all 16 candidates. It is regretful that we have lost one seat. However, we have obtained a majority of the city council. I think the candidates of the Komei Party will cooperate with us [on the base issues]. I would like to ask with conviction that the government stop the new base construction in Henoko. I will appeal to the voters about this issue in the run up to the gubernatorial election.